The Philanthropy initiative is a long-term project to collect, research, document, and display materials relating to the history and impact of American philanthropy, broadly-defined. 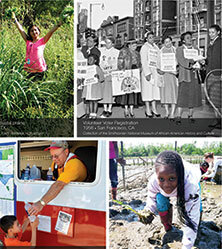 An annual program, The Power of Giving: Philanthropy’s Impact on American Life, and changing exhibition, Giving in America, explore the collaborative power of giving in all forms and at all levels across a wide spectrum of issues and movements. Visitors of all ages and backgrounds come to understand the ways Americans’ gifts of time, expertise, and resources continue to shape American history and reflect our nation’s ideas and ideals. Annual themes—such as sustainability and the environment—examine philanthropy’s impact on particular areas of need and make connections between historic and contemporary giving. For more on the Philanthropy Initiative, please contact Anna Karvellas, Philanthropy Initiative Program Manager.